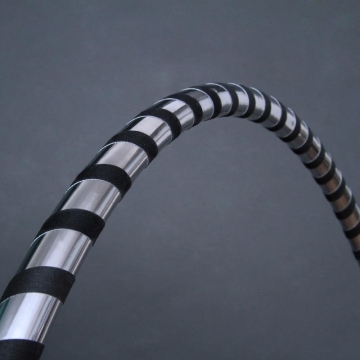 Anyone who believes that a modern and highly effective training device may not look good will be convinced of the contrary when looking at this Hula Hoop: a harmonious symbiosis of silver and black gives this model by Hoopomania a special and distinctive appearance. 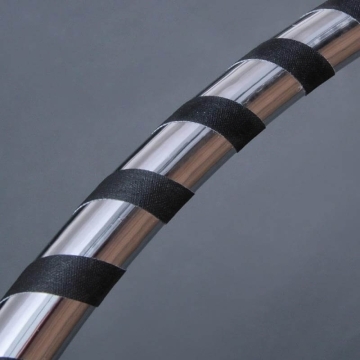 While the high quality silver design tape ensures a shiny appearance, the accurately wrapped black grip tape has the function of increasing the adhesion so that you can keep the Hoop more easily up in the air. We give you when ordering the opportunity to order this handmade quality product in 3 different diameters so that an optimal fit is guaranteed. The only 20 millimeters thin HDPE tube proves to be a reliable and very flexible basis for a new form of athletic efficiency that inspires more and more people. Elegant design and tangible functionality: Hula Hooping with Hoopomania brings more athletic momentum into your workout! With this design Hula Hoop, you will acquire a functional and flexible training device of the latest generation which can be used as Travel Hoop thanks to the built-in snap buttons. Only a few handles are enough to significantly reduce its size. Regular workouts bring your body and particular problem areas into a better shape. Are you ready for a new dimension of athletic efficiency? Then you should discover this trendy design Hula Hoop!